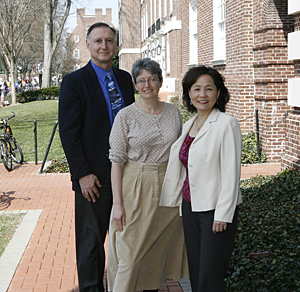 10:52 a.m., April 13, 2010----The University of Delaware is launching an innovative, new graduate degree -- the Professional Science Master's (PSM) -- in the fields of biotechnology and bioinformatics to help meet the future workforce needs of a growing bioscience industry. The aim of the new PSM degree programs is to produce graduates with in-depth knowledge of science coupled with strong business skills for careers in the bioscience industry, from pharmaceutical development to biofuels research, where the need for such highly trained professionals is in demand. Applications are being accepted now, with the first classes to begin this fall, pending approval of the programs by the University's Board of Trustees. “The University of Delaware is investing in the development of professional education programs that are excellent, unique, of high pay-off to the student, and of high impact to society,” University Provost Tom Apple said. According to the Talent Gap Analysis Report: Preparing Our Workforce for the Evolving Life Science Industry published by the Delaware Valley Innovation Network in 2008 and updated in December 2009, in spite of the current economic downturn, the outlook for the region's life science industry “remains bright,” with an anticipated job growth of 6.6 percent, or 4,200 high-tech jobs, over the next five years. 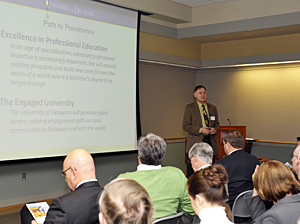 The University's new PSM degrees will give students the rigorous science and math of a traditional graduate science degree at UD, a major research institution, but also provide courses in business and project management, communications, policy and law, and team-building, which are essential for successful careers in industry, according to John Sawyer, associate provost for professional education. Sawyer, who is also a professor of business administration in UD's Alfred Lerner College of Business and Economics, worked with Melinda Duncan, professor of biological sciences, and Cathy Wu, Edward G. Jefferson Chair of Bioinformatics and Computational Biology, over the past nine months to gain input from the biosciences industry cluster in Delaware and the collaboration of deans and department chairs throughout the University to develop these programs, which recently were certified by the Council of Graduate Schools. Students spend their last six months of the PSM working in an industry internship or can take a half-time internship while completing the last half of the program. UD has internship commitments from such leading companies as Adesis, Air Liquide, ANP Technologies, AstraZeneca, DuPont, Strategic Diagnostics Inc., and more are in development, Sawyer noted. Mid-career professionals can complete the programs part-time while continuing their employment and conducting a professional project within their company. The science courses are the same as those taken by UD master's and doctoral students, and the business classes are taken alongside students in UD's nationally ranked MBA and/or MPA programs. Full-time students can complete the degree program in two years, and part-time students in three-and-a-half years, Sawyer said. UD's new biotechnology PSM is geared to students with a science or engineering background, according to program director Melinda Duncan, professor and director of graduate programs in the Department of Biological Sciences. The core curriculum focuses on cell biology, genetics, physiology, and molecular biology. Students can choose to specialize in one of an array of areas reflective of the excellence and breadth of research at UD, including agricultural sciences, biochemistry, chemical engineering, health sciences, marine science, and others. A major strength of UD's PSM programs, Duncan noted, is the opportunity for students to take classes taught by exceptional faculty doing cutting-edge research at the Center for Translational Cancer Research, the Delaware Biotechnology Institute, and the new Center for Bioinformatics and Computational Biology, among others. A leading authority, Cathy Wu, Edward G. Jefferson Chair of Bioinformatics and Computational Biology, is directing the new PSM in bioinformatics -- a field that, since the sequencing of the human genome in 2003, has become essential to the discovery of new knowledge from the vast amounts of data being generated in the biological sciences. The bioinformatics PSM has two concentrations--a computational sciences concentration and a life sciences concentration -- allowing students from different educational backgrounds to enter the program. The core curriculum includes an “introduction to discipline” course, which is geared to the biologist seeking a computer science background, or the computer scientist seeking a biological sciences background, Wu said. This interdisciplinary science training, coupled with the PSM “PLUS” courses, will prepare students for a professional career in bioinformatics on multidisciplinary teams in industry, business, government agencies, or nonprofit organizations. “With the life sciences becoming increasingly data- and information-intensive, the need for bioinformatics training will only grow in the future. It will play a critical role in discovery and innovation,” Wu noted. For more information, visit UD's Professional Science Master's Degrees Web site.